To our Bishops, Priests, Deacons and Deaconesses, all lay delegates and observers, invited guests and visitors, we extend a warm and cordial welcome to Charlotte, North Carolina and our 50th Synod of the Diocese of the Eastern United States (DEUS) of the Anglican Province of America (APA). I wish to extend to the Right Rev. Paul Hewett, representing the G-4 Bishops and his Diocese of the Holy Cross, a special welcome for taking the time and making the effort to be here for this milestone in the evolution of the DEUS. Bishop Hewett will be given an opportunity to bring greetings later. We welcome John Omwake, Editor of THE TRINITARIAN magazine and Fr. Paul Buetell, from the ACC parish of St. Peter’s in Christiansburg, Virginia. We also welcome back to this year’s Synod Bishop Kenneth Myers of Graceworks Ministry, as our Developmental Session speaker tomorrow. I am pleased to be back for a Synod in Charlotte with St. Michael the Archangel Church as host. It is hard to believe it has been 11 years since we had a Diocesan Synod here. This is also the place where 23 years ago September 1995, I was elected Diocesan Bishop of the DEUS. Many thanks to St. Michael’s Rector, Father Michael Cawthon, and our Synod Coordinator, Deaconess Tina Jenkins, for their hard work in planning, negotiating and supervising the Committees in order to make this a successful and pleasant time for us all. The theme for this year’s Synod is: Building on the past; Steadfast in the present; Vision for the future. I will begin with the past nine months since our Joint Synod in October 2017 as we had several changes to our clergy within the Diocese. Consecration, Ordinations, Retirements and Deaths along with other Clergy Changes in Our Diocese. The Rev. Tyler Phass, transferred from St. Alban’s, Joppa, MD (Deacon) to St. Paul’s, Melbourne, FL (Curate). The Rev. Mark Siegel, transferred from St. Paul’s, Melbourne, FL (Assisting Priest) to St. Alban’s, Oviedo, FL (Assisting Priest). The Rev. Scott Koszalinski, changed from Assisting Priest to Priest-in-charge, Holy Cross, Knoxville. The Very Rev. Mark Menees, appointed Dean of Central and Eastern Carolinas (replacing Bishop-elect David Haines). When we mention 50 years old, we usually think of a person who has entered the middle age of their life. We have seen the magazine header that says “the ‘60s are now the new ‘30s” and by inference we can assume the “the ‘70s are now the new ‘40s.” At this rate we will all live well into our 100s! When you mention that the Church, or our Diocese in particular, is now 50 years old, we actually know it is quite young in relation to the history of the Church militant. And indeed it is. We as a Diocese, in my way of thinking, are into our third generation, which seems a long time, but that is only because we tend to see things relative to our own life span. It reminds me of the comment made by Canon Mike Ward following the Ordination to the Priesthood of Fr. Tyler Phass, a millennial, in May of this year. When being introduced to Fr. Tyler’s father and other family members, he realized that he was older than Tyler’s father. I felt so old, he told his wife, that I started thinking I should consider retiring. Those of us who have been in this branch of the Body of Christ have often bemoaned the fact that the ‘Traditional Anglicans’ have been divided for so long and we wonder when they will ever get themselves together. Many of us have witnessed a number of starts and stops along the way of attempting to put things together but for one reason or another, mostly having to do with personalities, nothing of substance materialized. In my mind the answer is rather clear; it has to do with people, or more precisely, the necessary time to build trust relations among all the people. However, on the positive side, we have been part of a plan to bring together four major jurisdictions (referred to as the G-4) of Traditional Anglicans into a Full Communion (Communio in Sacris) relationship. After several years of working together, through meetings and conference calls with the Presiding and Archbishops, we signed a Document of Full Communion at the Joint Synods in Atlanta, Georgia in October 2017. This was an historic and a monumental step forward in ultimately bringing the jurisdictions into one Church after 40 years of separation. I have encouraged all concerned to be patient with one another as we work through the details of unification as each jurisdiction deals with its unique issues. I have encouraged each jurisdiction to form a committee of learned clergy to work on the largest issue, which will be in the area of church polity (Constitution and Canons). Over time each jurisdiction has developed its own culture and administrative process and the task will be to navigate our way through these waters and eventually arrive at conclusions acceptable to all. Not a small task. We of the G-4 Jurisdictions have recently received, an overture from the Union of Scranton, principally the Polish National Catholic Church (PNCC), among others, to enter into discussions with them which could lead to a more serious relationship. The PNCC is pursuing relationships with other with Traditional Catholic Anglican Churches just as we are. We have responded positively to their invitation to begin Ecumenical discussions. This is a major break- through and is a result of the G-4 jurisdictions entering into Full Communion. Bishop Hewett has been instrument in this relationship. The PNCC was invited and sent representatives to our Joint Synods in Atlanta, Georgia, this past October and were thankful for the interpersonal experiences that it allowed. The PNCC has had a regular dialogue with the Anglican Church in North America (ACNA), but that has been put on hold. Because of recent developments, it has become clear that, until the ACNA determines to hold to the orthodox teaching of a male priesthood, regular meetings have been deemed no longer necessary. As work continues with our G-4 partners, it becomes more encouraging to others outside of our ranks to see a promising future as efforts are being made to bring together the “Continuing Anglican Church.” At a recent G-4 Meeting of the Bishops at St. Luke’s Church, Amherst, New Hampshire, discussion centered on what next steps we might take to foster greater unity. There were discussions having to do with Clergy education, transfer of Clergy between jurisdictions and joint events with clergy and opportunities for bringing laity together. Of primary concern to all of the Bishops is to pursue Church unity without causing disruption to our individual jurisdictions. With that in mind, we proposed a “provincial” style of governance, one that would make no change to existing churches. In other words, each of the G-4 Jurisdictions would retain their own leadership, Constitution and Canons and Diocesan boundaries. In the next few years, the DEUS and the APA will be facing important leadership decisions. In 2020, I will, as your Diocesan and Presiding Bishop, have fulfilled the extended time under Section 8 of the APA Constitution which by resolution of Synod 2015 granted me an additional five years of service. It is my intention to have the election of a coadjutor at our next Synod in 2019. I am asking that each of our parishes and missions pray regularly that the Lord will guide and continue to show us the way forward in making Godly decisions for the leadership of our Diocese and Province. The popularity of the book, The Benedict Option has brought home to many of us the reality of how much our Western Culture has changed in the last generation. The way we communicate the Gospel and the way we come together as a Community has become more critical for the survival of the Church and the hope of the world. The missional church must learn to use language understandable to all people especially the non-believer. It must avoid so-called tribal-language, unnecessary evangelical pious “jargon,” and archaic language that seeks to set a “spiritual tone.” (When I say tribal language I am referring to that which is unique to particular denominations in our Country. I recall visiting the church where I grew up many years later as an adult and an Anglican, and was struck by the pious jargon spoken which used to be familiar to me many years before. I thought to myself, “are we guilty of similar codified jargon in the APA churches?”) Do we confuse or turn people off when we overly emphasize the 1928 Prayer Book or the 1940 Hymnal until they understand what “Traditional Anglicanism” is all about? Do we get into conversation prematurely about Women’s Ordination and Gay Ordination and why we do not approve of it in our Traditional Anglican Church? For those who never considered these issues, and view issues such as these as equal rights, this can be a no-win five-minute discussion. I am not saying if asked you shouldn’t respond. But respond with biblical truth in a loving and non-confrontational way. A missional church avoids “we-them” language, jokes that mock people of different politics and beliefs, and disrespectful comments about those who differ with or from us. It is important to remember as Traditional Anglicans we are not the Republican Party at prayer! Many of our parishes have people who are members or potential members who may not have the same political views. A missional church avoids even talking as if non-believing people are not present. Remember, there may be non-believers and seekers who need to feel welcomed and embraced by a warm loving inclusive Christian Community. Another important group for traditional Anglicans to be aware of are those discussed in a Harvard University study published in January 2018. In essence, the research showed no support for the myth of a widespread decline in Christianity. In fact, it rather showed there is a shift of Christians from some churches toward substantive Christianity where people may practice their faith with intensity and seriousness. The study shows an increasing gulf between the “dabblers” and the “faithful.” Traditional Anglicanism offers such a place. Unless these previously referenced items are the outflow of a truly humble, heart-felt desire to reach the unchurched and those seeking a more traditional expression of the Christian faith, it is all just adapting to the new reality and becomes superficial “marketing” and “spin.” I’m proud to say certain of our Parishes/Missions of our Diocese and Church have caught this vision of the world and the culture we are living in and have begun adopting a “missional” perspective in their outreach. They can be a resource for others and have already been so. For example, one of the exciting things happening in some of our parishes are the families coming from non-liturgical churches to our Traditional Anglican Church. These are people who go to church regularly and become part of the culture and structure of the parish. Often times they are families who are involved in “homeschool” cooperatives. This can open another area of participation for our local Traditional Anglican parish. They are definitely “believers” looking for authentic liturgy, Biblical teaching and preaching, as well as beautiful and classical music and substance in their Christian walk. They are learning to use the Prayer Book for family devotion such as Morning and Evening Prayer and believe in participating in at least weekly Eucharists and private Confession. These are those who have been disappointed in the Mega Church concept or the liberalization of their former denomination and are looking elsewhere. When they look to us we must embrace them and welcome them into the parish family. They are looking for what we have and not in changing the church into something they wish it to be. I encourage all of you, although I know some of you have already, who are leaders in your parish, to begin a study group on the subject of becoming a “missional” or mission-minded church and what that actually would mean in your unique Community. Yes, we need to be a home for those who don’t know our Lord and Savior, Jesus Christ and are seeking and searching, but also for those seeking a more historic and deeper expression of the Christian Faith which is found in the Classical Anglican Tradition. Some of you which I have already mentioned have used or are using The Benedict Option book as a textual aid. There are other books that are equally helpful and exciting that I have mentioned before in the Bishop’s Epistle at the website: AmazingParish.org. Two books this website recommends are: Rebuilt by authors White and Corcoran and Divine Renovation by Fr. James Mallon. I encourage you as leaders in your parishes to read, explore, discuss, experiment, brainstorm and with God’s help, we will all continue to grow well into the future. I wish to thank St. Michael’s Church members for their work in planning and executing this year’s Synod. First of all, the Rector, Father Michael Cawthon, who agreed to take on the challenge of hosting the Synod and Deaconess Tina Jenkins, Synod Coordinator, who took on the grand task of organizing and implementing the event. There are, of course, many others who helped make all of this happen by serving on committees, for which we are most grateful. 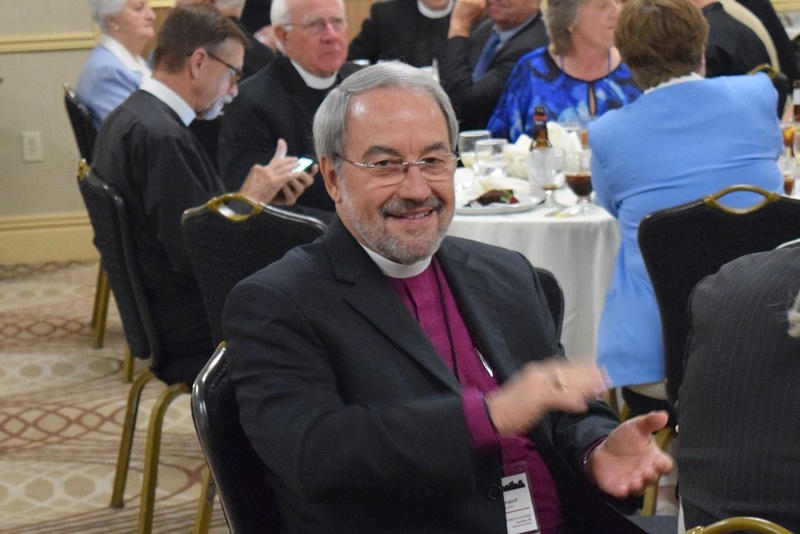 I want to thank all of you here for taking the time and making the effort to be here for this milestone Synod in the life of the Diocese of the Eastern U.S. The Lord has blessed us over the past year since we last met in October 2017 and increased our ministries. I want to thank our Standing Committee for their work and assistance over the past year. I will ask the Very Rev. Father Gordon Anderson, president, and all members of the Standing Committee to stand and be recognized. Rotating off the Standing Committee will be Dean Anderson and Jack Wyatt. We thank you for your service over the past 3 years. I want to recognize our Suffragan Bishops Chandler (Chad) Jones and William (Bill) Perkins who have assisted me in a number of Episcopal functions this past year, attending some Ecumenical Meetings on my behalf, and for their council and advice. Thanks and appreciation to St. Alban’s Cathedral and the Dean, Fr. Ralph Waterhouse, for his council and support. I would like to give special thanks to Lisa Ulrich, Executive Secretary for the Diocese and Province, who needs no introduction to most of you, for her ability to keep track of the many details of the office, all done with cheerfulness. A special thanks to Deaconess Linda Burns, who assists in a number of ways keeping track of the Registrar’s File for the APA and making sure my vestments are prepared and packed for my travels. I would like to pause for a few minutes to make special mention of three of our Clergymen who have passed from this life in 2018. Frist, Fr. Frank O’Donnell who died in January at age 77. He was the Vicar at St. Timothy’s Church in Swannanoa, North Carolina, and a supply priest at St. Peter’s Church in Kingsport, Tennessee. He was a former airline pilot and Episcopal priest before joining the APA. Next, my fellow bishop, Rt. Rev. Clark Dorman, who served as an Assistant Bishop in this Diocese died in April at age 96. He was still active until age 90 and able to celebrate Mass to his and his congregations great comfort. He was long time Rector of All Saints’ Anglican Church, Port St. John, Florida and he and the congregation built the church literally with their own hands. While a priest in the Episcopal Church beginning in the 1960s he had numerous Cures and being a pilot would fly to remote Mission Churches on Sunday to celebrate Mass. He left the Episcopal Church in 1976 and was received into the American Episcopal Church (our predecessor jurisdictional name) and became the priest in charge and then Rector of All Saints’ Church, Port St. John, Florida. He leaves his devoted wife, Peg, for whom we pray as she deals with the loss of her husband. Most recently was the departure of our dear friend and companion in the Gospel, Canon Ray Unterburger in May at the age of 67. His death was unexpected and untimely, for which we are all saddened. Father Ray was Rector of St. Paul’s Anglican Church, Melbourne, Florida, and most of you knew him as the Chairman of the Board of Examining Chaplains. So many of our men, who are serving in the ministry of this Church, went through the BEC on Father Ray’s watch. He is greatly missed and we remember him as we come together at this Synod. Please pray for Cheryl, his wife, who is with us today, as she deals with the loss of her husband. Please pray that Beverly, Peg and Cheryl will continue to be comforted by the Holy Spirit. Thank you to Canon Michael Ward, who has agreed to serve as Interim Chairman of the BEC to get us through this Synod. To all of our Chaplains, would you please stand and be recognized. I wish to thank my Bishop’s Advisory Committee members in the Upper and Lower Diocese who do the first review of all applicants for ministry. If the Chairmen, Deans Nick Henderson and Ralph Waterhouse, and the members would please stand and be recognized at this time. The Anglican Legacy Camp had another successful camp this past June. They had another full complement of campers. Father Mike Cawthon is the camp director. St. Michael’s Church, Charlotte, N.C., continues to play such a large part in sponsoring and supporting the Camp over the years and their efforts are greatly appreciated. Father Mike will have a report later. There are so many individuals who give of their time and energy along with their finances to make our Diocese work. Forgive me for not mentioning every one of you by name. I would like to thank our Area Deans. I want to once again thank our Archdeacon Erich Zwingert, for the work he does in many areas and am so grateful for his work on the webpage. Also, I want to mention the wonderful work he does on the DEUS Publication which provides not only the APA, but all traditional Anglicans, with needed publication of Prayer Books and other liturgical books. I hope all of you are taking advantage of checking the webpage for information of what is happening in our Province and Dioceses. Another part of our communications for the APA is our Newsletter, Ecclesia Anglicana. Father Dave Conway turned over the editorial work to Father Gordon Anderson. Thank you Father Gordon for taking on this work. Father Conway is battling cancer but has received some encouraging news recently concerning his condition. Please continue to pray for his recovery. For those who work behind the scenes and who are absolutely critical to what we do: like D. J. Fulton, Treasurer; Glen Wieland, Chancellor; David Arnott of St. Alban’s Cathedral who provides technical assistance to the Diocesan/Provincial Office, we thank you. Also, to our Vicar General, soon to be Missionary Bishop, David Haines, I extend my thanks, along with the Foreign Missions Board Members, Fr. Paul Rivard, Fr. Brad Cunningham, Deaconess Tina Jenkins and Dr. Mary Grundorf. Bp-elect Haines will give us an update on our Global Partnerships later. Our Domestic Mission Board is chaired by Bishop Bill Perkins with Bishop Chad Jones, Fr. Brad Cunningham, Fr. Nick Henderson and Fr. Wade Miller. Thank you for your thoughtful and conscientious work. To all who volunteer your time, talent and treasure in doing the vital work of our Diocese; to all of you here today, who are in most cases the backbone of your local parish and mission, you are most appreciated. A great thanks to Mr. Rick Watson who volunteered to be the Synod Organist once again for this year. I want to thank my wife, Mary, for her love of the work of the church and her continuing support, companionship and encouragement in the work I do as your Bishop. I thank all of you who welcome Bishop Chad and Bishop Bill and me on our visits to your parishes and missions on our Episcopal visits. May the Lord continue to bless and prosper our Church and Diocese as we begin our next 50 years in serving our Lord and Savior, Jesus Christ. Tomorrow we will have a glorious Eucharistic celebration at St. Michael’s Church as we Consecrate to the Holy Order of Bishops, Father David W. Haines as our first Missionary Bishop. That will be followed by a barbecue at the Church. God bless you for being here for this our 50th Annual Diocesan Synod of the DEUS.